In the Gospel of John, Jesus compares His Father to a gardener. God is pruning us, the branches of His vine, enabling us to bear more fruit and glorify our Father God. This is the concept of Kari Jobe’s stunning fourth album, The Garden. Birthed out of loss and heartbreak, this album resonates with the message that God is a miracle-working God who always comes through for His children. Kari resolved to praise and worship more than ever during her season of pain, and to see how God would take the ashes and make beauty from it. The Garden is the phenomenal result. 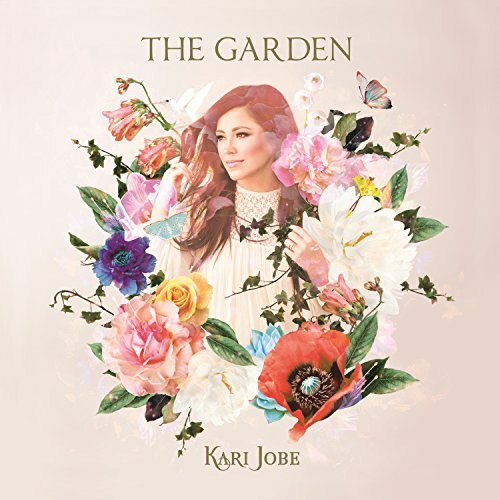 The Garden is the follow-up to Kari Jobe’s award-winning, best-selling live worship album Majestic. Three years after its release, Majestic is still one of my favorite albums, containing worship songs such as, “I Am Not Alone,” “I Lift My Eyes,” and Kari’s cover of the worship staple, “Holy Spirit.” I was very much looking forward to hearing The Garden, which also features Kari’s husband, Cody Carnes. I was not at all disappointed! Beginning on a haunting note with soft piano and deep cello sounds, the title track opens the album. Kari sings deeply and softly, “I had all but given up.” She solemnly describes searching eagerly for a sign of beauty and finding the answer in the garden that God is designing out of our pain. The highlight is the stunning bridge, where Kari angelically sings, “You crush all my fears with Your perfect love!” Complete with orchestral strings, the opening track “The Garden” does a phenomenal job of turning the listener’s attention away from their troubles onto the God who makes all things new and beautiful. “Let Your Glory Fall,” consisting of a piano/techno mix, comes next with a very strong chorus that perfectly matches the cry for the glory of God to rain down in our midst. Like “The Garden,” its highlight is the bridge, where Kari simply sings, “Oh let it rain!” as the drums and strong guitars build. The strength of this track is inevitably catchy – you will find yourself crying out with all your heart along with Kari for more of God’s glory in your life! Track three, “Heal Our Land,” is my personal favorite off The Garden, though it was available as a single before the release of the album. Based on 2 Chronicles 7:14, this soft track – sounding like the majority of the album Majestic – is a touching prayer-song, asking God to breathe on His church and pour out His presence on us so we can accurately represent Him to this lost world. Following is another techo-based track, titled “Lover of My Soul,” where Kari sings her love for Jesus and His love, in return, for us. Also deep-rooted in Scripture is “Speak to Me,” co-written by Bethel Music’s Amanda Cook. It is a very soft track, based on John 10:4 – Jesus’ sheep can hear His voice and will by no means follow the voice of a stranger. Kari softly sings about listening in the silence for God’s voice, confidently expecting Him to speak to us. Closing the track is a heavenly instrumental, where Kari’s vocals are echoed in the background, singing “I can hear You!” The listener is invited to sit still and listen to what God would speak to them, even as they worship along to the album. “Fall Afresh,” the sixth track on The Garden, is another personal favorite of mine – also released before the album. Similar in style and lyrics to “Always Enough” off Majestic, Kari passionately sings for a fresh outpouring of God’s presence. Very tranquil with its background synthesizers, I loved the lyrics that were easy to remember and sing along to – especially the bridge: “Holy Spirit, fill this heart again/ Holy Spirit, burn like fire within.” I have had this track on repeat, and it will no doubt be a favorite of fans of Kari Jobe’s Majestic album. “I Will Sing,” is a reminder to never cease singing and worshiping Jesus, “even when my breath is weak” and “even in my suffering.” I was reminded that God inhabits the praises of His people, which is the message that Kari sings about – we sing even when we can’t see Him moving, because we can be confident that He is! The slow strings and piano build strongly when Kari, very stunningly and angelically sings, “Hallelujah! I surrender all to You! Hallelujah! You are God, You won’t be shaken!” And then follows a string instrumental with strong, pounding drums. This track is simply breathtaking. Next, Kari covers Jesus Culture’s song “Miracles,” off their latest release Let It Echo. Though it has more of an emotional sound to it than Jesus Culture’s version, it is a powerful reminder that we believe in the God of miracles, who gives sight to the blind, makes the deaf to hear, and raises the dead. We can be confident that our miracle-working God is also working in our impossible situations, as the second verse shares: “The One who does impossible is reaching out to make me whole/ The One who put death in its place, His life is flowing through my veins!” It’s not possible to compare the two versions, as both versions are passionate and invite the listener to sing their way into the truth. Following are two tracks almost identical musically, very serene and worshipful. First comes “Closer to Your Heart,” which features Kari’s husband Cody, who sings the second verse and supportive background vocals through the choruses. Speaking of being in awe of His beauty and love for us, we are reminded that God draws us into His love. The track “Oh the Power” is a narrative of the agony Jesus endured during the last few hours of His life, yet how He chose to forgive and say, “Not my will but Yours be done” and “Forgive them Father, for they know not what they do!” The track automatically challenges the listener to do the same as they worship, forgive and surrender to the Father’s will for us. When Kari sings the bridge, “Oh the power of the cross!” it is impossible to not worship along whole-heartedly. “The Cause of Christ” ends the standard release of The Garden on a contemporary note. Stating that the only reason we live; why we will die; and why we surrender everything to Jesus in the time in between is “for the cause of Christ,” this closing track invites the listener to abandon everything and live for Jesus alone. The deluxe edition of The Garden features three more tracks, which, in my opinion, are must-haves! First is “Here as in Heaven,” a cover of Elevation Worship’s popular worship anthem. Calling down the kingdom and will of God, based on the Lord’s prayer in Matthew 6, Kari and Cody sing this phenomenal cover together. “Come Alive” aptly sounds very alive and energetic, while Kari sings about how the presence of God makes us come alive, while “On The Throne,” the album’s closer, borrows lyrics straight from Isaiah 43. Kari puts this message that we will walk through the fire and not be overcome, together with the fact that our King reigns on the throne and is able to bring us through any troubles we may face – the perfect story-book closing to this album. The Garden is simply phenomenal beyond words! Each and every track focuses on God’s goodness and beauty no matter how heartbreaking seasons of our lives may be. It takes the listener’s focus totally off themselves and invites them to come along, lay their burdens down at Jesus’ feet, and worship Him whole-heartedly. Complete with orchestral sounds, Kari’s angelic singing and the vocal support of her husband Cody, The Garden is easily Kari Jobe’s finest album yet (with Majestic as a close second). This is a worship album like no other that will definitely be on my repeat list! Enjoy this acoustic performance of "Heal Our Land"! Excellent Review Jay! This is my favorite Kari Jobe album hands down, since I can relate to almost every song. :) You captured each song perfectly! Keep up the good work!